An interesting events in Da Nang will be hold to celebrate New Year 2017, a fireworks display on Da Nang Beach. 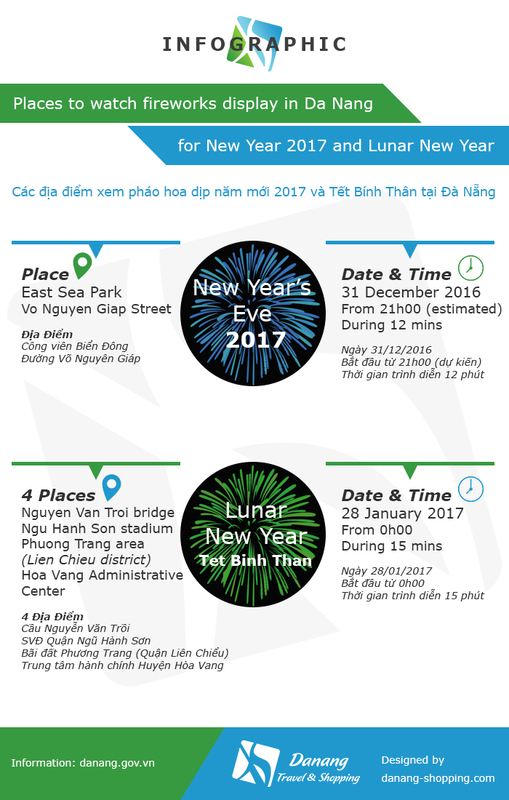 Similar to 2016 New Year Event, the 2017 fireworks display will be set up on the area near East Sea Park (Cong vien Bien Dong). This New Year 2017 fireworks display event is also an acitivity to mark 20th anniversary of Da Nang’s recognition as a centrally-governed city. According to baodanang.vn, two special musical performances to welcome in New Year 2017 and to celebrate the 20th anniversary will be broadcast live on both the DRT and VTV8 channels at 7.30pm on 29 December. The New Year Countdown Party 2017 will be held from 7.30pm on 31 December at the 29 March Square on 2 September Street.